I haven’t been posting much the last few days. Lots going on around here. Where to start? Well, HiJinx finally left me. She has been GREAT since my last posting. Full of energy, happy and content. When she went down she went down fast. Dr. Donna came to the house and helped her over the Bridge. She is such a wonderful veterinarian, so kind and caring about all of “her” babies. Jinx will be back with me in a few days, her ashes to join the others on my mantelpiece. I miss her terribly, but she went calmly, and I couldn’t stand to see her fall further until she was in too much pain. Isn’t it odd, how it is perfectly fine to put down a pet, but your family members? They are forced to suffer horribly just to make us feel better. Sigh. Let’s see. I had to replant my seeds because of a snowstorm last month. They were coming up well – – until I went to bed on Friday and woke up Saturday to four inches of snow and the flats buried. Gag. Well well well. So much for a garden this year, I suppose. I have been building the beds up, however. My neighbor, Ruth, came down and helped me get it started. We aren’t just throwing in purchased dirt. Instead, I laid cardboard in layers on the bottom. When you review products for Amazon there are a lot of cardboard boxes. So, layers! The next layer is tree cuttings, including big chunks of wood, limbs, and the layers of bark that have built up under the stacks of tree cuttings. The method is called Sheet Mulching or Lasagna Gardening. You layer in the “big stuff” then compost, horse manure, straw, weeds (yes weeds! Pull them up and toss them in, as long as they haven’t gone to seed) whatever you have on hand. I have two compost piles that were here even before I moved in (wow. 2007.) that I have continuously added stuff to. Grass cutting, food wastes, even paper towels go in there. Needless to say, opening up the cages left me with GREAT compost! I will be opening and using both of them, and I started a new one off to the side, so free soil! I need more horse manure – there is a stables just around the block, so I am going to try emailing them and see if I can come get some. Of course, I will have to walk over with my wheelbarrow… LOL. Maybe I can rent a pickup from U-Haul and fill it up? My back is feeling better and I have been doing my exercises – OH! And I have lost ten pounds, so that helps as well. Go, Me. Still have quite a ways to go, but hey, not bad huh? I also cleaned house (not bad, huh?) so that helps with the feeling down over losing my baby girl. Pft. I am a horrible cook, and a terrible housekeeper – I accept that about me – hee hee! Oh, but I did make bread! I used to cook, really well, but it isn’t like riding a bicycle – you do forget how. 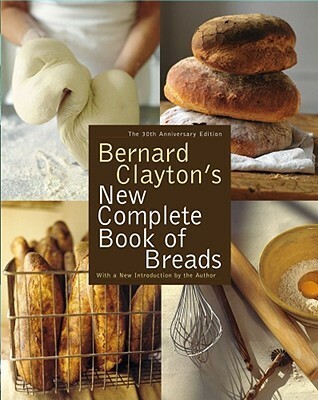 I dug in my cookbook collection (yes, I have one, even though I no longer cook) and pulled out Bernard Clayton’s New Complete Book of Breads. I used to use the book all the time – baking bread was my stress relief during a very difficult time in my life. Pfeffernus Brot, Coconut Banana Bread, Galette de Gannat, and Brioche. Those were my favorites judging from the stains on the pages! This time I used a recipe called Pain Battu Au Fromage, or Cheese Batter Bread. Batter bread means that it is really easy to do, even though it uses yeast (my long-time enemy!) and it is great to use for a base for other breads. I made the batter without the cheese, then made two different ones – one with sharp cheddar cheese, bacon and sun-dried tomato (Great sandwich bread!) and another with dried apricot, dried cranberry and pecans. That one I poured chocolate chips on top of… umm. I didn’t add any sugar, so it isn’t sweet at all, but the fruit flavours come through. So, I have edits to do so I better get back to work. Michael Angel’s next Dayna Chrissie book is on my desk (Woo Hoo!) and I am completely enjoying it! Have a lovely rest of the week everyone. 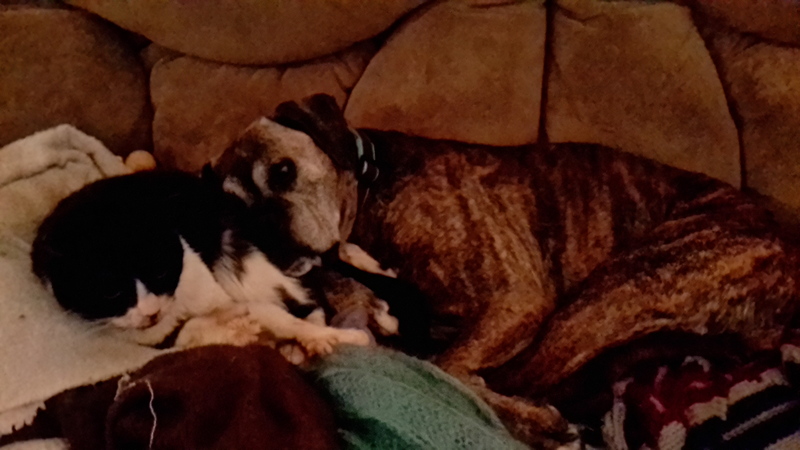 Sorry about Jinx – I know it is always hard to put our Furry family members down. Thanks Trent. She was a joy, and is greatly missed. Sorry for your loss. It’s difficult to remember the joy when our heart’s ache so terribly. Thank you, Meghan. She was such a joyful soul. I hope she is running through green fields, splashing in cranberry bogs with Lilly, one of their favorite things to do together as puppies, and playing with all her friends who have gone before…. thanks again. Sorry to hear your news – been there too many times, but that’s part of being providing a loving home for our fur babies, isn’t it? And I’m like you – I don’t get why we force people to endure often a terrible end, when we would consider it cruel to do that to our pets. Thank you Deb. I so appreciate your words. And yes – as I wrote to Melissa, that special time I had with her, after her strokes, when I changed her food and put her on the thyroid meds, was a gift – every single moment I got to spend with her was a very special time. She was happy and laughing the whole time. I can’t understand people who think that quantity of life is more important than quality – it just makes more sense. It breaks my heart to see people suffer when the reality of life is long past, the time only existence, in agony or doped up so much they don’t even realize they really Are still alive, except for the pain when the morphine wears off…. And I agree – the PL people are NUTS. they should have to raise all the unwanted children out there, the ones destined for unimaginable pain and heartache, for brutality and hatred and early agonizing deaths…. I am heartbroken for you at the news of Hijinx. I know how special she was to you. We are sending you our love. ♥ That bread looks ridiculously delicious! it’s always sad when our pets time is over, but they give us so much pleasure and part of owing a pet is doing the right thing when the time comes and keeping them pain free. Well done for making the humane choice. It always amazes me that we can’t have the same rights to be free of pain as animals. When dying is inevitable we can choose to set our pets free but humans have to suffer in agony. Thank you Jeannie. Your kind words are much appreciated.